There should be a well-defined and developed strategy for each segment of your business. If referrals is an area you currently generate a lot of business from or hope to generate a lot of business from, you must spend the time to create and implement your strategy. Most agents rely too heavily on the mailing strategy: mailers such as calendars, recipe cards, football schedules, and other so called “items of value.” This marketing for referrals, through what I call the “trash and trinket strategy”, is marginally effective. It falls far short of the personal phone calls or personal visits that allow you to make a personal request for referrals. When creating your referral strategy, you must realize that people send referrals for a number of reasons that are personal to them. There are two reasons that are usually high up on most people’s lists of reasons. Trust and Friendship: Most people are willing to help people that they trust and like. If you have done a wonderful job for them, if you ask, they will send you future business. Share your goals and vision for your business with these people, and they will help you even more. If they can catch your passion and enthusiasm and see how they can help you with your dreams, you will create a valuable referral source. You can elevate them to a level where they feel a vested interest in helping you achieve more success. People want to be Champions for others: When we deliver world class service and the outcome or the result meets or exceeds the expectations of the client, our benefit beyond the commission we earn is that we create clients who are willing to champion or promote our business. These people know the quality of your performance and service first hand. They know the service quality their family and friends will receive is very high. They become heroes to those people for connecting the parties together. Another strategy that many agents are trying to achieve is a 100% referral-based business. That strategy seems to be very popular. We profess to be “by referral only”, as if that is some elite statement, and our worth or value in the marketplace is enhanced because of this objective. Let me be honest, that stance comes from the sales trainers who teach referrals as a marketing strategy in order to sell more tickets at their seminars. If that is a primary focus of your business strategy, there is danger lurking. Relying entirely on referrals for new client creation is a very narrow, exclusive, and un-balance approach to business. You leave yourself, your business, and your revenue extremely vulnerable to the changes in the marketplace. When real estate is appreciating at a rapid rate and everyone’s equity is growing in their home, it’s easy to generate a lot of referrals. The awareness of the market is very high and very positive. In those marketplaces, real estate sales and investments in real estate are topics at every cocktail party, reception, and dinner table in America. When the newspaper and the media are reporting the positive trends of the real estate market, the motivation to move and invest in real estate increases. 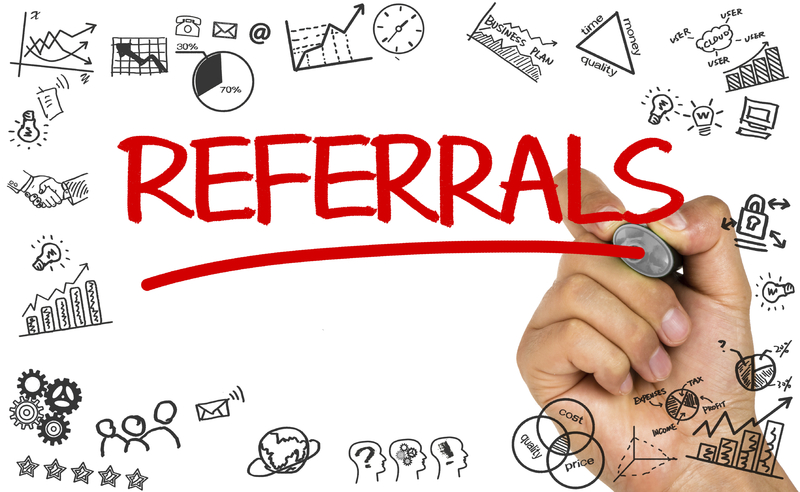 Referrals are at an all time high in these markets. However, when markets are at normal levels or below level, referral volume drops dramatically because everyone in the world isn’t a potential buyer or seller anymore. This same phenomenon happened in the late ‘90s with the dot.com stocks. Everyone was talking about how much they were making on Internet stocks; everyone had a piece of dot.com explosion. Then the bottom fell out, and everyone moved back to the blue chip stocks. The exuberance was so high about the dot.coms, we were buying stocks in companies that had not or wouldn’t turn a profit in years. Referrals reduce when the reason people want to sell and buy is more than for the frenzy of investment purposes, whether they live in the home or not. It’s a poor business decision to put all your eggs in one basket. Solid businesses have multiple lead generation areas and multiple customer types they sell their products and services to. If you don’t have some level of diversity, something bad can (and probably will) happen. Look at Delphi Industries in 2005. Delphi’s a large multi-billion-dollar company that manufactures automotive parts. Their primary client is General Motors. General Motors accounts for over 70% of their gross sales receipts. When GM fell on hard times, Delphi had to declare bankruptcy because their biggest source of business revenue dropped significantly. The parallel between Delphi and the 100% Referral Agent is startling. If your referrals decline, you won’t have other prospecting or marketing systems in place to dig yourself out of trouble. The trouble you will experience will come fast. The referral gurus don’t bother to reveal these truths because it would be bad for their business. Your strategy must be balanced. Lastly, your strategy must focus on sellers. The 100% referral strategy without a seller focus as well will tip your business to the buyer side. You will end up with more transactions from buyers than sellers. You will generate more buyer leads and buyer transactions through referral sources. Most consumers view agents as people who place people in their car and drive them around to sell a house. They don’t view us as salespeople who represent their interests in the sale, marketing, exposure, and market evaluation to maximize equity to our clients. I have analyzed hundreds of agents’ businesses and tracked their numbers. When you evaluate the referral segment of the business, it produces more buyers than sellers by at least two to one with some approaching four or five to one. To become a Champion Agent with the earnings and quality of life you want, you can’t be four or five buyers to one seller or even two to one. The referral pillar of your business should be the strongest and should create the best quality leads and the most transactions of all other sources. It just can’t be the only source, as many agents are trying to make it.